Installed as Pastor of St. Joseph's Old Cathedral on March 1, 2015, I have been a priest of the Archdiocese of OKC for over 20 years; A native Oklahoman, born into a anti-Catholic non-practicing hodgepodge of Protestantism. I added the ninth branch, when I was baptized in high school as an Anglican (high church). In college I finally came to the conclusion that these ecclesial communities were not the fullness of faith, and through the study of the Shroud of Turin, I completed my initiation into the Faith in June of 1984. 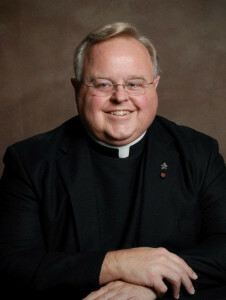 * Chaplain and Founder of the first Post of the Oklahoma Catholic War Veterans. * I served for over 17 years as the Catholic Chaplain to the Oklahoma City Police Dept. I have 13 Godchildren, most of whom I have baptized. I am the youngest of four children; two of us are still on this side of life. I am a member of Tau Kappa Epsilon Fraternity; the Secular Franciscan Order; a member of the Knights of Columbus, fourth degree; and am a Knight Commander of the Equestrian Order of the Holy Sepulchre of Jerusalem, with the Pilgrim Shell. I have been honored to serve as Honorary Canon on ceremonies at the Holy Sepulchre, in Jerusalem, three times with His Beatitude, the Latin Patriarch of Jerusalem and his auxiliary bishops; and was chosen to be a principal concelebrant at Holy Thursday Mass, at the Pontifical Institute of Jerusalem, in the Presence of their (former) Catholic Majesties of Spain, Juan Carlos and Sophia; while the Apostolic Nuncio of the Holy See to Palestine, Israel and Jordan was the celebrant (2005). I hold a BA in religion, philosophy and history (Conception Seminary College); M. Div., and an M.A., in Pastoral Theology, from the Philadelphia Theological Seminary of St. Charles Borromeo, Overbrook. I was a broadcasting major in college (University of Central Oklahoma) and am a life member of the alumni association. I worked in law enforcement before going to the seminary. I have hosted my own radio shows twice, once before seminary and once as a priest before the birth of OCBN.